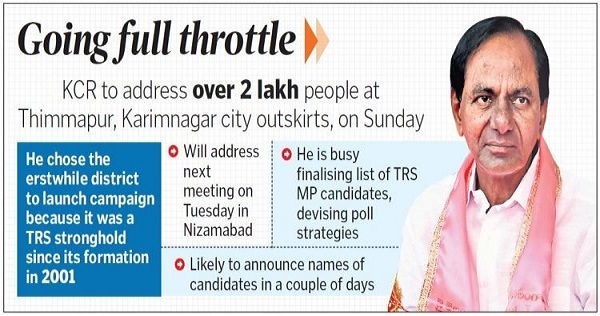 Chief Minister and TRS president K Chandrashekhar Rao will kickstart his Lok Sabha election campaign from Karimanagar on Sunday. He will address a public meeting of over two lakh people at Thimmapur on the outskirts of Karimnagar city. He is expected to explain the need to elect 16 MPs from TRS to enable the party play a vital role in national politics and ensure addressing the just demands of people in the State. Telangana State will face polls in a single phase on April 11. As the process of filing nominations begins on Monday, the ruling TRS is launching a full-throttle campaign. While the party working president KT Rama Rao already commenced his meetings with party workers, Chandrashekhar Rao will start addressing a series of public meetings across the State. The Chief Minister is learnt to have chosen Karimnagar to start the poll campaign, considering that the erstwhile district has been a TRS stronghold since its formation in 2001. He represented Karimnagar in the Lok Sabha earlier and also served as Union Minister in the effort to gather support from various political parties for creating separate Telangana State. Nizamabad meeting on Tuesday After the public meeting in Karimnagar, the TRS president will address another meeting at Nizamabad on Tuesday. TRS sources said he was confident of winning 16 MP seats of the total of 17 seats where the TRS ally, AIMIM, is contesting from Hyderabad Lok Sabha constituency. For the last a couple of days, he is learnt to be busy finalising the list of TRS MP candidates and devising poll strategies as well as issuing instructions to the party leaders accordingly. At the public meeting, Chandrashekhar Rao is likely to elaborate on the TRS’ plans for playing a vital role in national politics. He had been reiterating that neither NDA nor UPA were in a position to come to power on their own, and TRS, along with AIMIM, winning all 17 MP seats will ensure a better deal for the State, including good flow of funds and development projects. He is also likely to announce names of TRS candidates in a couple of days even as filing of nominations will begin from Monday. TRS leaders made elaborate arrangements for the public meeting at the Sports School ground spread over 35 acres at Thimmapur village near Lower Manair Dam on the outskirts of Karimnagar city. About 2.5 lakh people from seven Assembly constituencies of Huzurabad, Husnabad, Manakondur, Karimnagar, Choppadandi, Sircilla and Vemulawada under Karimangar Parliament constituency, are expected to attend the meeting. Groundwork done Ministers Etela Rajender and Koppula Eashwar and B Vinod Kumar, MP, have been camping in Karimnagar for the past few days and are supervising the arrangements. Preparatory meetings were held in all Assembly constituencies. Local MLAs were appointed as in-charges of their respective Assembly constituencies to coordinate with the party leaders to ensure a smooth campaign and create awareness among people over importance of the TRS winning 16 MP seats. Buoyed by the landslide victory in the recent Assembly elections, the TRS leadership is making serious efforts to repeat similar results in the Parliament elections. The TRS is keen to take up the issues concerning the State on national platforms through the proposed Federal Front, along with like-minded political parties at the national level.